Your night vision security cameras, and security camera system in general has a natural predator. This pest can eat up hours or even days of your recording time quickly, causing you to overwrite video that you may have needed to see. Spiders are the culprit of many such calls that I have had from customers. This is why it is important to take steps to ensure that you will have your video when you need it. It may seem simple, and it is...depending on what type of recording system you currently employ. Many DVR and NVR recorders make it easy to find video if you know what time something happened, but that doesn't help you much when it comes to finding out why your archive, which normally holds 30 days of video only has 8 days now! With many systems, you will simply be dumb-founded by why you only have 8 days, and will have to sit and playback video for hours to find out what is causing it. The most important thing though is to check regularly to ensure that you know how much recording time you have, and notice if that recording time starts dropping drastically. Once it is discovered that there is less video than normal, there are several popular causes, so it is important to try to narrow down the possibilities. Many systems however make it difficult to find the cause, because their playback is very linear. Your lack of recording archive could be caused by any of the above factors or more. Eliminating possibilities on many systems could really take a lot of man-hours for most security camera DVRs and NVRs, because someone will have to playback video from multiple times of day to find out what is causing the motion, and determining the reasons for the recording, then making adjustments and trying again. With our AVM (Advanced Video Management) DVRs, NVRs and HDVRs you don't have to spend hours or hundreds of dollars hiring an IT to check it out. With this system, you can quickly and visually see what cameras are recording too often, then scan through those times in a matter of seconds to discover the exact reason and fix it, so that you can once again achieve better recording times. The video above shows how we did this on our own system to find out why one of our HD cameras was recording constantly, in seconds of time. 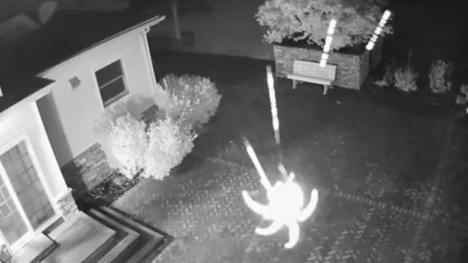 Now the solution is quick and easy - simply knock down the spiderweb, and it will stop recording so frequently at night. Don't let your recording archive get overwritten by a dancing spiderweb. Keep an eye on your recording times, and employ a system like our AVM NVR Systems, which will help make light of this chore. We also offer system maintenance plans - Let us keep an eye on your archive recording space remotely and let you know if we find a threat to your recording.